My Son just recently started to clap his hands. I know it is really not that exciting, but to me it is! 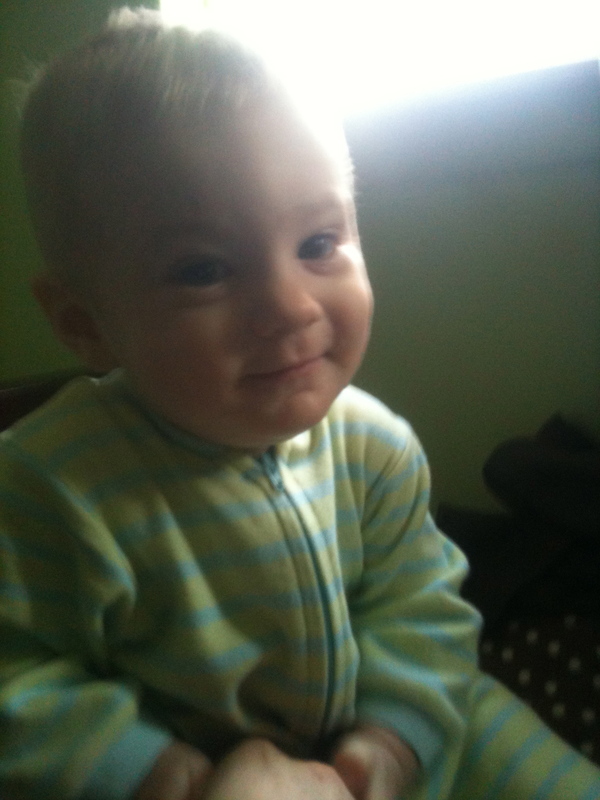 He is nine months old and grows so fast is it unreal. He is young and still cannot do that much stuff. Most days I take him by the hands and have him walk around the house holding my hands so he can practice walking. It is so cool to see him grow and learn new things. He even learns things that Allie and I don’t remember teaching him… like clapping. I asked her if she was teaching him it and she thought it was me. That is pretty funny to me but nonetheless he claps all the time now. Shameless Plug** Cutest Baby Boy Ever! I was thinking about the whole clapping idea. Psalms 47:1 Come everyone! Clap your hands! Shout to God with joyful praise! This is one of the verses in the Bible that talks about clapping. It makes me wonder, Why clapping? When in life do we clap our hands? We clap when someone performs, to show them we approve of their performance and give them acclaim. Basically it is to praise them for what they did and let them know how awesome we think they are. Praising them is simply defined as the act of expressing approval and admiration. It is not hard to think about performers that we admire for what they have done. It is easy to clap when we are at a performance, show, or game and the people do a good job. We show them our approval by clapping and shouting. How else would they know? Just think about the noise produced when an entire stadium begins to clap and cheer. It is extraordinary. When you or I walk into a worship service what exactly is our goal? To show admiration to our God! To express outwardly what we feel inside about our Savior and King. What else can we do? Sure we can sing, we can tell him, but the word of God even says To clap and Shout. The truth is we don’t have much to offer. When we gather together as one voice in the name of Jesus, we seek to let him know how we love and adore him. Clapping our hands is something. We may not have much, we may not be that great at clapping on the beats, but who cares. We just want Him to know. I may not be that great of a singer, but I can shout. And what happens wen we truly want to let a performer know how great they are? We give them a standing Ovation. Next time you are in a “Worship” service think about why your clapping. Think about why you are standing. Think about the reason that you shout. It’s not because the worship leader said to do it, or it is just what Christian people do in church. It is because you want to show admiration to Your Saviour. And if that means, just like my son, all you can offer is a clap here and a shout there, then that is far less than He deserves but it is what little you have that you can give! It’s not about you, how you feel or how you will be perceived. It is and always will be about God. Your outward expression of the Hope he has given you inside. And when we give him this little bit when we gather together, it will build the courage to give more of ourselves as we walk out his truth throughout the week. After-all if it is difficult to express how you feel about God in a church, how much more difficult will it be out in the world. Let’s gather and do what we were created for… Praise Our God… any little way we can! This entry was posted in baby, Bible, christian, God, Worship by Raul. Bookmark the permalink. Excellent blog! I agree if we cant express how we feel about God in church then how much more difficult will it be when we are out in the world! Good stuff! “It’s not about you, how you feel or how you will be perceived. It is and always will be about God. Your outward expression of the Hope he has given you inside.” Well said! I enjoyed your post a lot Raulie! Thanks Ben, good to here from you buddy!! Love this! Sometimes I try to figure out why he is clapping at the random times he does it. Now I can think of julian showing his love for me n Jesus when I give him a bottle, a toy, a bath, a smile or maybe for no reason at all. He’s just joyous and wants to show God all the time.